updates and information relevant to our area. seems suspicious or unusual and report it to the police. It may help solve or prevent a crime! as soon as we receive them. 14th April: Sleight of Hand Theft warning to shops and Post Offices 11th April: Tool Thefts 30th March: Fake Virgin e-mails 30th March: Livestock Worrying 27th March: Suspicious Doorstep Sales of Power Washers, Chainsaws etc If you believe that you have been a victim of fraud you can report it online at: www.actionfraud.police.uk/report_fraud or by telephone on: 0300 123 2040. Dorset Police are asking people to be vigilant and to report rural crime. Click here to see more. enquiries. The new 101 number has replaced the previous non-emergency police number. cost 15 pence per call no matter what time of day you call, or how long you are on the phone. into your home. Don't leave ladders outside, or chain them up if you have to. with coach bolts is the most effective way of securing a door. such doors are also available. cell (Dusk till Dawn light). 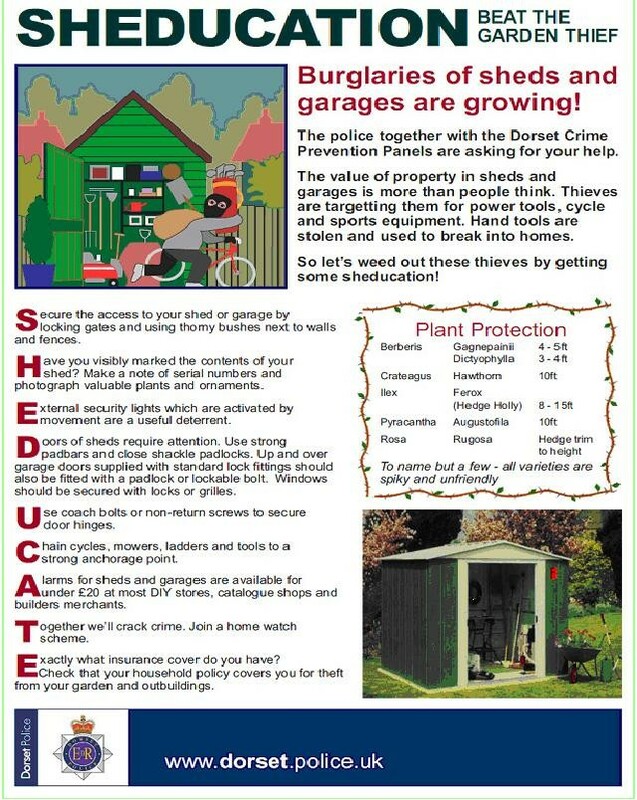 Check that your household insurance covers theft from your garden and outbuildings. will also reduce their value to the thief. Fit a battery-operated alarm. These can cost less than you think. cable and a good quality padlock. Doorstep crime - where criminals trick their way into peoples’ homes or con people to having work done - causes great distress to the victims who are often the most vulnerable members of society. Dorset Police sees a rise in such crimes through April to June, so we are asking the public to be vigilant and to report any suspicious activities. In no circumstances give your bank account details or Personal Identification Number (PIN) to anyone – over the phone or on your doorstep. Our message is simple; ‘be sure who is at your door’ and never accept work from anyone who tries to sell you services at your door. Never let anyone into your home if you don’t know them. There is a key message for householders – don’t be rushed into accepting a quote or believing scare-stories peddled by doorstep callers. Sit down, have a cup of tea and take some advice. Friends and neighbours can check things out, and our Buy with Confidence scheme will find you trusted and reliable traders. Crime Prevention Guidance: • If you are not sure who is at your door – don’t open it. • Remember to use your door chain if you have one before you open your front door to strangers. • Always check the identity of all visitors if they are not known to you before opening your door. • Always look up telephone numbers for yourself – do not accept numbers provided by callers as they could be bogus. • Beware of common tricks such as being asked to make a telephone call, wanting to retrieve a lost ball (even if it is a child) or being asked to check your water, gas or electric. If in doubt keep your door secure. • Always keep doors and windows secure – it is easy for strangers to enter the rear of your home when you are busy answering the front door to their accomplice. • Don’t keep large quantities of cash at home. Put it in a bank or Post Office account. • To find an approved trader, call Citizens Advice Consumer Service on 0345 404 05 06 or visit www.buywithconfidence.gov.uk. • If you think a friend or relative has been victimised call the police on 101 or 999 if a crime is in progress. Trading standards officers are warning Dorset residents about copycat websites dealing with applications and renewals of Blue Badge disabled parking permits. The unregulated websites may appear to offer a quick and easy application but in fact charge at least £49 for minimal help in completing the application form, and they have no authority to issue a Blue Badge. Dorset residents who use these sites will still have to submit their applications to Dorset County Council and pay a further £10 to cover the genuine application fee. These copycat websites are in no way affiliated to the Blue Badge scheme and many ask for personal information such as bank details and National Insurance numbers, which could be used for further fraud. Complaints are being received by the county council in increasing numbers from residents who have unnecessarily paid excessive amounts to apply for a Blue Badge. Ivan Hancock, Trading Standards ser-vice manager for Dorset County Council, said: “Steer clear of these rip-off sites. Many are based overseas so are difficult to tackle when problems arise. The official Blue Badge costs £10 and you can find more information on the eligibility requirements and how to apply for or to renew a Blue Badge through the Council’s website or through the Government’s official gov.uk pages.There are all sorts of scams based on applications for official documents we need so all consumers need to stay alert to this risk. Best advice if you don’t know the reliable website you need already is to use the official ‘gov.uk’ websites for any government services such as renewing driving licences, passports or European Health Insurance Cards, rather than rely on search engines that often display copycat sites.” To report a problem with a copycat website contact the Citizens Advice consumer service on 03454 04 05 06. This is the first point of contact for consumer advice or to report any consumer problem to Trading Standards. For information about the Blue Badge scheme and how to apply please visit: www.dorsetforyou.gov.uk/blue- badge. The telephone preference service (TPS) is a valuable resource and is supported by the Dorset Police but instances have occurred where members of the public have registered on the TPS website and have later received a telephone call from a person who stated they are responding to the TPS registration and asking for a fee of £39 to complete the registration. This is a scam and you should not pass on your bank or credit card details. If you have been contacted by a person stating they are from the Telephone Preference Service and have paid money for this free service it is strongly advised that you report the incident to ACTION FRAUD on 0300 123 2040 as well as contacting your bank as soon as practical. Police frequently receive reports from worried residents in relation to silent phone calls. The fear is that someone is just checking whether they are out. Police have investigated these calls in the past and there is nothing sinister to be concerned about. It is usually companies that telephone-sell goods using multiple dialling, which phones 20 lines simultaneously, and as soon as one person answers, all the other phone lines are cut. You can stop at least some these unsolicited calls easily by registering with the Telephone Preference Service. The number to stop these sales calls is 0845 070 0707. ...particularly lead from roofs, are an increasing problem. There have been several incidents in West Dorset. Local awareness and identification of strangers is an invaluable defence. Buckland Newton is therefore joining the police initiative 'Church Watch', and those living around that part of the village will be receiving invitations asking for their support. If you see anyone acting suspiciously around the Church, or anywhere in the village, the police would like to know straight away. Better a false alarm than missing a wrongdoing. Dorchester Police 01305 222222. Scams – if you are scammed it is worth reporting as all the information is collated and investigated. You can report it on Action Fraud or 0300 1232040. Everyday tens of thousands of people across the UK open their post to find that they have apparently won money in a lottery or have a special parcel awaiting delivery on receipt of a delivery fee or following a premium rate telephone call. Many others receive phone calls telling them similar stories. DON'T BELIEVE THEM Watch out for these warning signs: • You must send a fee to make your claim • The company is based overseas or has a PO Box address 3H_ • You are asked for your credit or bank account details • You must call a premium rate telephone number (090...) • You must respond immediately to claim your prize It's an unsolicited letter, phone call or e-mail In short, never spend any money in response to these scams... Doorstep traders are similar so never allow anyone through the door without being sure who they are. IF IN DOUBT SHUT THEM OUT. You can always take their identity card and ring their employer to check them out There is a sticker available from Scamwise Southwest for use on a glass panel on or near the front door which tells unwanted visitors not to bother to ring or knock. If you would like one please ring them on 08454 04 05 06.